Composting and Weeds – proper gardeners’ talk! Even in a tiny garden in London we had two compost bins. Admitedly they were little drum-like green plastic ones:– one the local council had subsidised the cost of, which you have to lift off the whole drum to reveal the compost; the other, also plastic, was made of slats that you could pull a couple up a bit from the bottom to get at the compost. This second one was a hand-me-down and arrived minus a lid – so we used a dustbin lid on it. 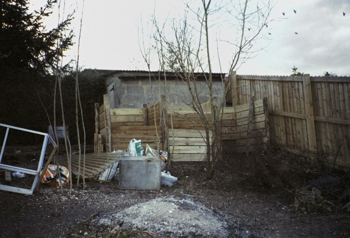 Having visited many gardens and watched “proper” gardeners on the TV, I really wanted three huge compost bins made out of pallets joined together, and this is what I specified when we arrived on our Chalk Hillside. They were to go along the side of the existing shed, beside the soon-to-be vegetable garden. However, apart from the fact that we didn’t have enough pallets to complete the job – whoever built the shed in the fifties or sixties had not made it three pallets long! Undeterred we sourced pressure treated wood, and set to copying the idea. If you have been reading my previous posts you will now be laughing to yourself because you will be aware that these compost bins are about 150ft, (50m) from the house, and you are picturing me running all that way down the garden in the dark and wet with kitchen waste to tip onto the compost heap. Even in a tiny garden in London the compost bins were at the furthest point from the back door, and it quickly became really obvious that NO WAY were we running down to the compost bin with onion skins, potato peelings, tea leaves etc, each time we made any compostable waste. We have a three stage process for composting kitchen waste. We have a canister in the kitchen (now with a lid, there’s posh – for years it was just an empty plastic mushroom pot) which everything compostable goes into – layered up with envelopes and old bills, paperwork that would otherwise need to be shredded. When this gets full it gets tipped into the bin outside the back door. This is a swingbin bottom with a roof tile on it which as it gets full gets taken down to the main heap. We had levelled the ground to make the bays, and continued the level out to make a path to the front of the bays, contained by more of the pressure treated wood. As we dug out the veg bed, we threw all the flints onto that space in front of the compost bins to make a firm and level path. The idea was that it was big enough for a wheelbarrow to get to it to tip into the bays. However, the hurdle doors were too heavy for me to lift by myself, and generally needed two of us to get them clear of the posts, so as I am the main filler of the compost bins, I took to using two tubtrugs as I gardened. One for “bad weeds” which got taken to the dump, and one for things for the compost. Then I could carry the tubtrug of “good weeds” to the compost when full, and tip it in whether the hurdle doors were on or not. This also meant I could ensure I was mixing the sappy garden waste with either sere garden waste, or scrunched up newspaper or recycled envelopes, junk mail letters etc which are kept in bags in the shed for easy access. 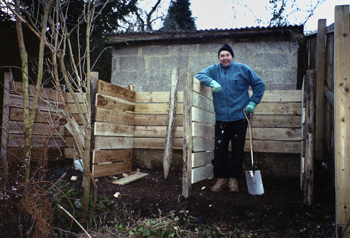 Composting is a case of balancing sappy green stuff and dryer brown stuff so that it aerates as it goes to allow the oxygen to heat the heap and get the decaying going, whilst not letting it get too wet or dry. When I first started it all sounded extremely complicated, but I tried to work on the principle that I put a 10cm layer of green things in, then I put in 10cm of brown stuff and stir it a bit. What constitutes “good weeds” for composting purposes? John Seymour of Self Sufficiency fame said that we should regard annual weeds as a crop from the soil for the compost heap, and as long as they had not set seed, they should go on it. At this point I should say that my husband regards this as “technical weeding” i.e. you have to be able to identify one plant from another to be able to say a) it’s a weed, b) it’s an annual weed, and c) it hasn’t set seed yet. Not surprisingly, he refuses to do technical weeding on the grounds you need to be a proper gardener and he is “The Muscle”. What you are NOT supposed to put in is perennial weeds. So what pernicious weeds do you have in your garden? As I said last time, we have bindweed (Calystegia sepium or hedge bindweed). Not all over, just up by the house. Further down we have the less rampant field bindweed (Convolvulus arvensis). Apart from weeding it out, I also try putting in supports for it to grow up rather than the plants, so I can pull it out. Sometimes it works! I have also mentioned brambles (Rubus fruticosus). I thought these should be easier to get rid of than bindweed. I worked down the bed beside the fence on the left looking down the garden clearing all the weeds, and digging out the bramble roots (mainly by the fence and fence posts.) Where I couldn’t get the root out being too deep I called in The Muscle, and he dug them out. It looked like we had all of it out. So I planted up the border. Up came the brambles again. Now the bed was too planted up to allow The Muscle to excavate huge holes to get all the roots out without destroying lots of plants. My ecologist friend Caroline told me that her strategy was to keep cutting them back which would eventually weaken the brambles. I believed her. Twelve years in and I have to say there is no noticeable reduction in the vigour of our brambles…. We have Ground Elder (Aegopodium podagraria). This was new to me. When I started weeding the huge rectangular rose bed that filled the whole garden for about 15 meters down, I discovered the entire top layer of what should have been soil was in fact a tangled mass of yellowy brittle roots. It was like removing a carpet up to 15cm deep. I read up and realised that like bindweed the plant regrows from the tiniest bit of root left behind. I discovered that every so often the plant threw a root straight down, and I think these I never managed to get properly out. Also, although the roses were growing happily within their carpet of ground elder roots as their roots went much deeper, the ground elder grows through and under their roots so that you cannot be sure you have got all the ground elder root out without compromising the rose and its roots. This is also true where it was growing round large shrubs. This has allowed the Ground Elder to retain a foothold in the garden and it is always trying to take over. Here you can see the white umbels of the ground elder flowering in the foreground, and the hedge bindweed growing up a support in the rose garden here in June 2015. Please tell me you have found a way to get rid of ground elder? I remember Christine Walkden on one of her gardening programes saying she cut the green leaves off and put them in the compost but I never have. Also Richard Mabey in his book Food for Free says you can cook and eat the leaves like spinach, though even in the 16th Century when they ate it more John Gerard said in his Herball of 1597 that “once taken roote, it will hardly be gotten out again, spoiling and getting every yeere more ground, to the annoying of better herbes”. Although not as huge a problem we also have dandelions (Taraxacum officinale). When we dug out terracing we discovered that some of these dandelions have roots longer than 60cm, so no wonder I cannot eradicate them, they and the plantain (Plantago Lanceolata), which is another thug, are gradually taking over my cowslip meadow. Another plant that I consider a weed (though I will put it on the compost) is ivy (Hedera helix). It was growing up many of the shrubs on the right hand side of the garden, and along the ground. Whilst it was easy enough to remove from the ground, the roots had grown through the bole of the red-flowering weigela and I cannot cut it or dig it out without killing the shrub. It had also grown all over the ground in the lower half of the orchard as well as smothering many trees. Again, I conquered it on the ground, and from many trees, but it was all that was holding much of the fence on that side of the garden up, so it keeps returning to several trees, including the Wild Cherry tree (Prunus Avium). Before you start an outcry, Ivy is extremely useful in the shade, and I encourage it in lots of places in the garden particularly in its adult form as it is a great source of nectar for bees, butterflies and hoverflies later in the year. Red Admiral butterfly on my Ivy (Hedera helix) flowering in October last year. I would love to hear your strategies for dealing with these weeds – and how successful they are. Next time, putting up a polytunnel. 0 Comments To "On a Chalk Hillside February 2017 "